Asad Haider and Salar Mohandesi analyze the Occupy movement and the conditions that created it. For us, it just means that we should talk about the weather. It’s going to start snow­ing on the occu­pa­tions, and the author­i­ties want to use the weather as a weapon. They’re hop­ing that win­ter will kill the move­ment off, and it’s hard to deny that camp­ing out in the mid­dle of Jan­u­ary would be a poor tactic. But the weather rep­re­sents a much big­ger ques­tion: what will it take to make this move­ment last? There is great poten­tial in what has been achieved, but there are also sig­nif­i­cant obsta­cles, which present them­selves both inside and out­side the move­ment. With an eye towards advanc­ing this strug­gle, let’s start by try­ing to under­stand what’s hap­pen­ing: who is protest­ing, and what does it mean? In a reflec­tion on the riots in Lon­don this past sum­mer, “The Prince and the Pau­per,” we argued that the com­po­si­tion of the riot­ers reflected the blurred bound­aries between a pre­car­i­ous and hyper­ex­ploited “lumpen­pro­le­tariat” and the main­stream work­ing class. What was impor­tant above all was that the spon­ta­neous vio­lence of the riots took place at the same time as a strike by Ver­i­zon work­ers across the pond, within the very indus­try that pro­vided the riot­ers with means of com­mu­ni­ca­tion. And though strug­gles were com­mu­ni­cat­ing with each other across the world, these two polit­i­cal com­po­si­tions – one reflect­ing a dis­or­ga­nized pop­u­la­tion usu­ally sub­jected to the worst state repres­sion, the other reflect­ing the clas­si­cal mode of trade-union pol­i­tics – did not encounter one another. The Occupy Wall Street crowd seems to be an in-between ele­ment, both tech­ni­cally and polit­i­cally. Much of the energy behind it comes from the activist milieu that char­ac­ter­ized the Seat­tle “anti-globalization” protests, but it also clearly draws from a wide base of work­ing peo­ple who are now see­ing the dis­in­te­gra­tion of clas­si­cal forms of work along­side the social fab­ric that once sup­ported them. So the Occupy move­ment is simul­ta­ne­ously the space where encoun­ters can take place, as well as a form of strug­gle with the implicit objec­tive of cre­at­ing con­di­tions in which these encoun­ters can take hold. But who exactly is in this space? The best infor­ma­tion we have now is about Occupy Wall Street; though other occu­pa­tions may have unique ele­ments, this serves as a use­ful start­ing point. The com­po­si­tion of Occupy Wall Street is unsur­pris­ingly het­ero­ge­neous. Age, wealth, and expe­ri­ence vary widely; some par­tic­i­pants are vet­er­ans from for­mer strug­gles, oth­ers are join­ing in for the first time; there’s a large con­cen­tra­tion of youth, but more than 28% are over 40. You’ll find the home­less, doc­toral stu­dents, and pro­fes­sion­als of var­i­ous stripes all camp­ing out together. Despite these sharp dif­fer­ences, how­ever, some com­mon char­ac­ter­is­tics stand out. First, the vast major­ity is highly edu­cated: a study by CUNY soci­ol­o­gist Hec­tor R. Cordéro-Guzmán observed that over 90% reported “some col­lege, a col­lege degree, or a grad­u­ate degree.” Sec­ond, the great major­ity does not sup­port either of the polit­i­cal par­ties. Third, and per­haps most impor­tant, the move­ment as a whole is over­whelm­ingly com­posed of the unem­ployed, under­em­ployed, or pre­car­i­ously employed. In many impor­tant ways, it’s no coin­ci­dence that this par­tic­u­lar tech­ni­cal com­po­si­tion would choose the Occupy move­ment as its form of strug­gle. By fir­ing work­ers, putting them on fur­lough, demand­ing that they work part-time, or sim­ply forc­ing them to accept an early retire­ment, the cap­i­tal­ists gave them all free time. Instead of sit­ting at home, these work­ers are using this imposed free time against those cap­i­tal­ists who forced it upon them in the first place. The Occupy move­ment demon­strates how work­ers can cre­atively turn their sit­u­a­tion against their bosses, how they can trans­form an imposed form of pro­duc­tion into a weapon. It’s not so much a kind of pro­longed march as it is a trans­formed strike, work stop­page, or col­lec­tive slow­down. It’s a form of strug­gle that has emerged directly from the par­tic­u­lar eco­nomic sit­u­a­tion that cap­i­tal has led us into. But not only is it a form of strug­gle, it’s a bridge between a mul­ti­plic­ity of forms, where already exist­ing move­ments can cross-pollinate and new ones can be tested for the first time. This bridg­ing is inter­na­tional in char­ac­ter. Inspired by the Arab Spring, the strug­gles in Greece, and the Span­ish indig­na­dos, Occupy Wall Street first emerged as yet another moment in this broader cycle of strug­gle. It’s sig­nif­i­cant, how­ever, that after becom­ing a real move­ment by spread­ing itself across Amer­ica, this form of strug­gle then found its way back into the hands of those who had inspired it in the first place. There is no greater illus­tra­tion of the cir­cu­la­tion of strug­gles today: from Puerta del Sol square in May, to the occu­pa­tion of Zuc­cotti Park, and back to Madrid in Octo­ber. But it’s not as though the same coin has passed through thou­sands of new hands just to return to its owner unchanged. The cir­cu­la­tion of this strug­gle has added some­thing; it returns with more expe­ri­ences, a sharper per­spec­tive, a more rad­i­cal edge. On Octo­ber 15, protests erupted in 900 cities across the globe. Though many had already wit­nessed their fair share of dis­tur­bances over the past few years, it was the bold syn­chronic­ity of it all that was so unprece­dented. This could have only been accom­plished through a recod­ing of each par­tic­u­lar strug­gle into a more gen­eral ver­nac­u­lar. Of course, all of these strug­gles were already implic­itly – and in some cases explic­itly – in touch with one another. But now, they speak the same lan­guage. Slo­gans reap­pear, sym­bols are shared, and prac­tices are recy­cled on dif­fer­ent con­ti­nents. Strug­gles all over the world are begin­ning to recode them­selves in this idiom. The dilemma is that while unions have expressed their sup­port, orga­ni­za­tions like Occupy the Hood are attempt­ing to pri­or­i­tize the sec­tors of the work­ing class that are racially mar­gin­al­ized, and inter­na­tional strug­gles are tak­ing up occu­pa­tions as their ban­ners, no con­crete and insti­tu­tional con­nec­tion has been made. It could very well be that the dura­bil­ity and rad­i­cal­iza­tion of this move­ment will rely on its poten­tial as a medi­at­ing ele­ment between the the var­i­ous seg­ments of the class, their par­tic­u­lar inter­ests, and their tra­di­tional forms of strug­gle. Achiev­ing this means going beyond a spon­ta­neous reflec­tion of changes in our work­ing lives. It has to start by under­stand­ing the sys­tem under­ly­ing them. We all know how the protest rep­re­sents itself. “We are the 99%,” said Occupy Wall Street, and this sin­gle slo­gan has spread like a prairie fire. Only a philis­tine would dis­miss the move­ment based on objec­tions to this slo­gan. A quick glance at the now-famous web­site wearethe99percent.tumblr.com shows what it has achieved. In a soci­ety that is sup­posed to be hope­lessly atom­ized, made up of alien­ated zom­bies star­ing at indi­vid­ual TV screens, ordi­nary peo­ple are show­ing sol­i­dar­ity with each other. The prob­lems peo­ple describe on this web­site might once have been thought of as per­sonal issues, of no con­cern to any­one but your spouse and your land­lord. Occupy Wall Street has given us the lan­guage to under­stand our per­sonal prob­lems as a col­lec­tive polit­i­cal strug­gle against the 1% who got rich from our misfortune. At the same time, the slo­gan advances no analy­sis about how things got this way. Social inequal­ity is shame­ful, to be sure, and it’s been grow­ing steadily. But does this hap­pen because there are bad eggs at the top? Because the good guys in gov­ern­ment aren’t strong enough? Or is it because there’s an under­ly­ing rela­tion­ship in our soci­ety that pro­duces this inequal­ity and ensures that it con­stantly increases? The top line rep­re­sents worker pro­duc­tiv­ity, mea­sured by out­put per hour. The line lag­ging behind is their hourly com­pen­sa­tion, which means wages plus ben­e­fits, adjusted for infla­tion. The grow­ing “wage gap” between the two lines essen­tially mea­sures the change in the rate of exploita­tion, and it shows that exploita­tion has been steadily increas­ing. This doesn’t mean there wasn’t exploita­tion before the 1970s, it just means that social inequal­ity wasn’t grow­ing; now big­ger and big­ger por­tions of wealth are being trans­ferred from labor to capital. In 1865, Karl Marx engaged in a debate in the First Inter­na­tional Work­ing Men’s Asso­ci­a­tion against a utopian social­ist named John Weston. Weston argued that the wave of strikes across Europe demand­ing higher wages was dan­ger­ous, since if wages were increased, cap­i­tal­ists would sim­ply raise com­mod­ity prices to com­pen­sate and make life more expen­sive for work­ers. Marx argued in his speeches, later pub­lished as Value, Price and Profit, that this posi­tion was based on a totally incor­rect under­stand­ing of the wage. Cap­i­tal­ists pay a wage that ensures the worker will show up to work the next day, equiv­a­lent to the socially aver­age col­lec­tion of neces­si­ties (food, hous­ing, enter­tain­ment) required to repro­duce labor-power, or the abil­ity to work. They don’t pay for each indi­vid­ual com­mod­ity the worker pro­duces, because the cen­tral fact of cap­i­tal­ism is that work­ers pro­duce more than the value of their daily neces­si­ties. The dif­fer­ence between their wages and the value of the com­modi­ties they pro­duce is the “sur­plus value” that belongs to the cap­i­tal­ist. No other input of the pro­duc­tion process gen­er­ates more value than it costs; the exploita­tion of labor is the source of profit. What Marx pointed out is that if there is an increase in the pro­duc­tiv­ity of labor, but wages stay the same, strug­gles for higher wages have to be under­stood as “reac­tions of labour against the pre­vi­ous action of cap­i­tal.” If cap­i­tal can’t pay work­ers less, or work them longer hours, it has to increase the pro­duc­tiv­ity of labor by dis­ci­plin­ing work­ers and intro­duc­ing tech­no­log­i­cal inno­va­tions. This has two dra­matic effects. First of all, it reduces the demand for labor, which means unem­ploy­ment. Sec­ond, it means cap­i­tal­ists are invest­ing more in expen­sive machin­ery than in their source of profit. If pro­duc­tiv­ity has dra­mat­i­cally increased, and indus­tries across the board pro­duce many more com­modi­ties, they need peo­ple to buy them – but that’s dif­fi­cult to pull off when wages have been so low for so long. The result of ris­ing social inequal­ity is that cap­i­tal­ists are sit­ting on vast amounts of money, or chan­nel­ing it into a lux­ury econ­omy, and banks are run­ning out of prof­itable invest­ment oppor­tu­ni­ties. Work­ers, on the other hand, need money just to live. The solu­tion to these prob­lems is well known. The wide­spread reliance on con­sumer credit – a risky invest­ment for the banks and poten­tially life­long debt for the con­sumer – increases pur­chas­ing power beyond the wage. Along­side the use of home equity loans and credit cards to shore up con­sump­tion is the mas­sive stu­dent loan indus­try, which lends future work­ers the resources to develop their pro­duc­tive pow­ers. In the­ory, these debts would be paid off by future income, assum­ing some kind of immi­nent recov­ery. The prob­lem is that peo­ple grad­u­at­ing with enor­mous and unrea­son­able loans are not get­ting jobs, and as we’ve already noted, cap­i­tal­ism is tend­ing towards unem­ploy­ment. With the clas­si­cal sys­tem of exploita­tion by the wage under­min­ing itself, cap­i­tal is forced to find ways to use debts to extract wealth. Ever paid an over­draft fee? There’s also a dra­matic polit­i­cal effect of debt: it pre­vents peo­ple from desert­ing the sink­ing ship of the wage sys­tem. In spite of the fact that nobody expects a job to become a life­long career any­more, which used to be work’s way of jus­ti­fy­ing itself, they’re still forced to accept pre­car­i­ous work – rush­ing between mul­ti­ple part-time jobs unre­lated to their edu­ca­tion, if they have jobs at all, and cut­ting every pos­si­ble expense to pay off their loans. This is just an exten­sion of the bru­tal strat­egy of expro­pri­a­tion already imposed on the poor­est sec­tors of the work­ing class, the preda­tory lend­ing that specif­i­cally tar­geted black and Latino women. Just as stu­dent debt estab­lished a sup­ple­men­tary form of exploita­tion, by com­pelling peo­ple to pay for the rest of their lives to acquire a com­pe­tence they may be unable to cash in on the job, sub­prime mort­gages prac­ticed exploita­tion at the site of repro­duc­tion. Low-income work­ers who needed an address, a place to main­tain their abil­i­ties to work and to insti­tu­tion­al­ize their social exis­tence, found them­selves strug­gling to pay an unman­age­able debt until the bank sim­ply took the house back to sell it again, pock­et­ing the already-extracted payments. It should be clear that these very vis­i­ble actions by finance can’t be reduced to the greed of indi­vid­ual crim­i­nals. They are the vio­lent and reck­less attempts by cap­i­tal­ists to defend and rad­i­cal­ize the exploita­tion that took place in the wage sys­tem, in spite of the grow­ing con­tra­dic­tions of that sys­tem. So we have to decou­ple our rhetoric from notions of cor­po­rate power and law­less bankers. It’s a rela­tion­ship we’re fight­ing, not a bunch of guys in expen­sive suits. What the 99% slo­gan moves us towards is a con­cept of class. It’s the lad­der that we’re using to climb up to a class analy­sis. But to really develop that analy­sis, we’ll have to leave the lad­der behind. “We are the wage rela­tion” is not a very good slo­gan. It’s a shift in per­spec­tive that indi­cates the need for new slogans. The 99% is a coali­tion built upon many dif­fer­ent ten­den­cies, inter­ests, and projects. While it helps us unify our sep­a­rate strug­gles, dis­cover the social in the per­sonal, and forge our dif­fer­ent demands into a com­mon dis­course, it ulti­mately con­ceals more than it reveals. The dan­ger is most appar­ent when we con­sider that some of the ten­den­cies within the Occupy Move­ment hope to use the momen­tum of the strug­gle to enter into a prof­itable alliance with finance. The “professional-managerial sec­tor,” or what has been com­monly though erro­neously labeled “the mid­dle class,” is cer­tainly part of this 99%. But it’s a pecu­liar part of this per­cent­age: although it is exploited by cap­i­tal like every­one else, it nev­er­the­less occa­sion­ally prof­its from its own exploita­tion. As that layer which embod­ies the inter­ests of both labor and cap­i­tal, the “mid­dle class” stands as a vari­able and poten­tially dan­ger­ous ele­ment within the move­ment as a whole. The “mid­dle class” is, in its own way, tor­mented by wage labor – we think of what Ric­cardo Bellofiore and Mas­si­m­il­iano Tomba describe as “the lack of social life, the end­less cig­a­rettes, the psy­chic dis­tur­bances and the hem­or­rhoids of our ultra-modern knowl­edge work­ers.” But this layer also has a ten­dency to look for a way out – not by abol­ish­ing exploita­tion in gen­eral, but by tak­ing a cut of the exploita­tion of lower-income work­ers. The professional-managerial lib­er­als want to make finance work for them; their gam­ble is to co-opt the more exploited sec­tors of the pro­le­tariat, to claim to speak for the whole work­ing class, to use reform as a means of sta­bi­liz­ing the wage rela­tion rather than putting it into question. In many ways, it’s an old strat­egy that goes at least as far back as the French Rev­o­lu­tion. The Third Estate united its het­ero­ge­neous com­po­nents by recon­sti­tut­ing itself as the nation. Every­one else – the upper clergy and the nobil­ity – was regarded as a mere par­a­site idly leech­ing off the labors of the over­whelm­ing major­ity. The dom­i­nant fig­ures of the Third Estate – the busi­ness­men, lawyers, and aspir­ing politi­cians – at first hoped to use the strength of the move­ment to advance their own dis­tinct inter­ests rather than those of the masses. Even some aris­to­crats threw in their lot with the masses in the hopes that they too could domes­ti­cate it. This was all in 1789. But now we’re in the twenty-first cen­tury – we don’t need another French Rev­o­lu­tion. So we have to ques­tion the strange resur­gence of the lan­guage of par­a­sitism. It’s a con­ve­nient way to reduce the objec­tives of the move­ment to noth­ing other than cast­ing off the par­a­sites in order to pre­serve the body. And the rhetoric of the 99% helps dis­sem­ble the very real con­tra­dic­tions slowly tear­ing apart that pur­port­edly coher­ent body. The dan­ger is all the more severe when we remem­ber that this body is not so much Amer­i­can as it is international. Beyond the divi­sions within the Amer­i­can “99%” there are global divi­sions. Inequal­ity of wealth extends to the inequal­ity between nations and sug­gests that the sit­u­a­tion of the work­ing class varies with national bound­aries. In many nations work­ers are caught between the increas­ing impov­er­ish­ment of agri­cul­ture and an unsta­ble slum life struc­tured around con­tin­gent or infor­mal work. Farmer sui­cides in India are echoed by iPhone fac­tory worker sui­cides in China. The Amer­i­can inflec­tion of the slo­gans now cir­cu­lat­ing glob­ally is sig­nif­i­cant. It sig­nals the deci­sive reen­try of the United States into this inter­na­tional cycle of strug­gle; the dom­i­nant pole of cap­i­tal­ist accu­mu­la­tion can no longer dis­tance itself from the strug­gles rend­ing the rest of the world. 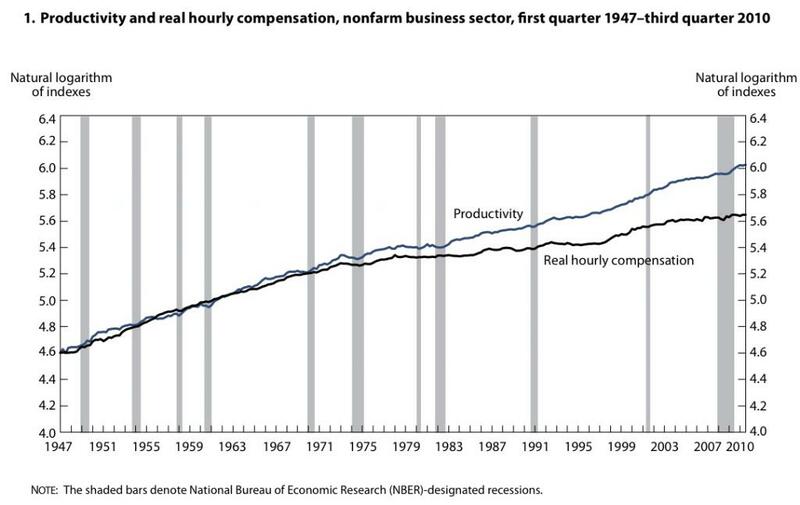 But there is a dan­ger that the grow­ing sig­nif­i­cance of the Amer­i­can strug­gle will begin to blind us to the dis­tinct char­ac­ter of other strug­gles and the spe­cific his­tor­i­cal form of the wage rela­tion in which they have found them­selves. The Israelis began with a hous­ing cri­sis, the Chileans attacked edu­ca­tion, the Greeks aimed at aus­ter­ity, and the Fil­ipinos united against Amer­i­can impe­ri­al­ism. Move­ments in the coun­tries of the “Third World” will have to take on a dis­tinct set of inter­ests and strate­gies pre­cisely because their com­po­si­tion is already so dif­fer­ent. So while the Occupy move­ment has allowed these dialects to trans­late, it will have to avoid the risk of oblit­er­at­ing its par­tic­u­lar­i­ties. The con­tra­dic­tion is not between a homo­ge­neous inter­na­tional major­ity against an equally homo­ge­neous inter­na­tional minor­ity, but between the dif­fer­ent poles of a global wage rela­tion that nec­es­sar­ily assumes dif­fer­ent forms in dif­fer­ent places. The media like to sug­gest that the Occupy move­ment is the Tea Party of the left. And maybe there are some sim­i­lar­i­ties: both are socially het­ere­oge­nous, both have brought together indi­vid­u­als from across the coun­try, and both have sev­eral decen­tral­ized griev­ances, some of which may even be the same. Where they dif­fer most strongly, how­ever, is their rela­tion­ship to the state. While the Tea Party has strate­gi­cally insin­u­ated itself with the Repub­li­can Party in the hopes of reori­ent­ing the state itself, the Occupy move­ment has con­sis­tently refused to do the same with the Demo­c­ra­tic Party. The Democ­rats are too polit­i­cally impo­tent to effec­tively co-opt the move­ment, and even the unof­fi­cial demands of the occu­pa­tion are well beyond any­thing the Democ­rats will ever be will­ing to get behind. Most sig­nif­i­cantly, the move­ment rejects the entire party sys­tem. The Cordéro-Guzmán sur­vey dis­cov­ered that the vast major­ity of those involved in Occupy Wall Street – some 70% of the respon­dents – iden­tify as polit­i­cally independent. This sig­nals a major shift in the polit­i­cal cul­ture. While just a few years ago the Democ­rats were able to rebrand them­selves as a party of oppo­si­tion, change, and new hopes, they’re now widely regarded as oppor­tunists with noth­ing to offer. This legit­i­ma­tion cri­sis forced open a wide vac­uum on the left of the polit­i­cal spec­trum that has been filled by the Occupy move­ment. But while the move­ment has clearly aban­doned the Demo­c­ra­tic Party, it has not yet defin­i­tively aban­doned the state. There are two ten­den­cies that fetishize the state. The first is the typ­i­cal lib­eral call for finan­cial reg­u­la­tion – if it was the unreg­u­lated avarice of the cor­po­ra­tions that got us into this mess, then we can resolve it by pres­sur­ing the state into reg­u­lat­ing them more tightly. The sec­ond, para­dox­i­cally, is the oppo­site end of the spec­trum, the “End the Fed” Ron Paul fanat­ics who believe that fiat cur­rency is the root of all evil. The shared ide­o­log­i­cal assump­tion of both these ten­den­cies is that the state and the mar­ket are some­how totally dis­tinct actors with con­trary interests. So the com­par­i­son with the Tea Party should lead us to an unex­pect­edly impor­tant ques­tion: why is the only anti-government rhetoric to be found on the right? The para­noid notion that “big gov­ern­ment” seeks to take away the pri­vate prop­erty of indi­vid­u­als is a mys­ti­fied under­stand­ing of the real­ity that wealth really has been trans­ferred away from middle-income Amer­i­cans, and it accu­rately intu­its that this process has been over­seen by the state. We don’t have to spend a lot of time empha­siz­ing the fact that the state not only rep­re­sents the inter­ests of the wealthy, it’s actu­ally com­posed of them. Every­body knows this. Add to this that all these processes of finan­cial­iza­tion have been admin­is­trated by the state. The bail-out was no aber­ra­tion; it just con­firmed who the state is here to sup­port. Con­sider the telling exam­ple of stu­dent loans. Since 1965 the gov­ern­ment has under­writ­ten pri­vate lenders who facil­i­tate an increas­ingly expen­sive col­lege edu­ca­tion, as part of the Fed­eral Fam­ily Edu­ca­tion Loan Pro­gram. What this means is that the abil­ity of uni­ver­si­ties, includ­ing for-profit col­leges, to rad­i­cally increase tuition, and of pri­vate lenders to prey on more stu­dents, has been enabled by the gov­ern­ment. The pol­icy was ended in 2010, but not before mak­ing it absolutely clear in 2005 that the gov­ern­ment was not inter­ested in extend­ing any sup­port to the bor­row­ers: stu­dent loans have become nondis­charge­able, leav­ing a gen­er­a­tion of unem­ployed grad­u­ates with­out the option of declar­ing bank­ruptcy. The only win­ners are the finan­cial cor­po­ra­tions, which have been pack­ag­ing stu­dent loans into lucra­tive finan­cial prod­ucts called stu­dent loan asset-backed secu­ri­ties. Even the most recent mea­sures announced by the White House only make it eas­ier for peo­ple to get into debt; they do noth­ing to coun­ter­act the 8.3% increase in tuition at pub­lic colleges. In spite of the government’s vis­i­ble defense of the cap­i­tal­ist class, the ten­dency on the left is to imag­ine that we can some­how just nego­ti­ate with the state. It’s not the first time this has been attempted. A mil­i­tant labor move­ment con­fronted cap­i­tal on the shop-floor dur­ing the 1920s and 1930s. Cap­i­tal and the state were forced to find a way to sub­sume and con­trol this threat; that strat­egy was called the New Deal. Under the pres­sure of World War II, the Com­mu­nist Party entered into an alliance with the Democ­rats and threw in its lot with the New Deal, sup­press­ing rank-and-file activ­ity in the name of the “no-strike pledge.” The sit­u­a­tion estab­lished had seri­ous con­se­quences after the war. The labor bureau­cracy set the stage for its com­ing decline; they strength­ened cap­i­tal and paved the way not only for the Smith and Taft-Hartley Acts, the legal foun­da­tions for the purg­ing of com­mu­nists from the unions, but also for the dev­as­tat­ing sep­a­ra­tion of the work­ing class from the labor movement. Rec­og­niz­ing that the state is an adver­sary, how­ever, doesn’t mean moral­is­ti­cally ignor­ing it. It won’t wither away if we just refuse to engage with it out of prin­ci­ple. The les­son from our labor his­tory is not only that alliance with polit­i­cal par­ties is treach­er­ous, but also that mean­ing­ful reforms were won by the labor move­ment as a result of mil­i­tant and antag­o­nis­tic strate­gies, extend­ing from the 1919 Seat­tle gen­eral strike to the 1934 San Fran­cisco gen­eral strike. It would be the worst sec­tar­i­an­ism to reject reforms; they alle­vi­ate suf­fer­ing and advance the posi­tion of the work­ing class. But the ques­tion is whether mean­ing­ful reforms can be achieved within the polit­i­cal lim­its of cap­i­tal­ism. If the polit­i­cal appa­ra­tus is con­trolled by the cap­i­tal­ist class, this means that those lim­its are not exter­nal lim­its that can be over­come by a stronger pro­gram. Instead, they are inter­nal to the strat­egy of reform. The only way to force the cap­i­tal­ist class to con­cede reforms is to con­front it with an antag­o­nis­tic agent, a uni­fied work­ing class. Let’s not delude our­selves into think­ing we can con­vince them with our bet­ter ideas. Today the imme­di­ate tac­ti­cal ques­tions of the move­ment also pose the ques­tion of the state. In a telling inter­na­tional exchange between the var­i­ous occu­pa­tions across the world, a New Yorker ques­tioned occu­piers in Frank­furt about their deci­sion to request a per­mit from the police. Not­ing that Lib­erty Plaza was occu­pied with­out a per­mit, she asked why the Ger­mans had asked for one, won­der­ing if such col­lab­o­ra­tion with class ene­mies could have been the result of a “cul­tural dif­fer­ence.” But why not be flex­i­ble, on the look­out for open­ings that can be strate­gi­cally exploited? Some com­pro­mises may advance the class posi­tion, allow­ing a move­ment to con­front the state on a dif­fer­ent plane. If the state is will­ing to give us a per­mit, let them make that deci­sion and live to regret it. The ques­tion of police per­mits touches more gen­er­ally on the police force itself. Are they, as some pro­test­ers have chanted, part of the 99%? From the start there has been a clear ten­sion with the police. They have made arrests, have begun infil­trat­ing the var­i­ous occu­pa­tions, and will cer­tainly be called in, as they have been in Berlin and Oak­land, to vio­lently crush the movement. But the chal­lenge of the police is that they gen­uinely are work­ers, and their work is to repress pro­le­tar­ian antag­o­nism. This para­dox is not to be taken lightly. Nei­ther blindly defend­ing them as fel­low work­ers nor blindly attack­ing them as hated pigs will help us now. Any fail­ure to under­stand their spe­cific func­tion is either a reformist dan­ger or an adven­tur­ist error. The impor­tant point in Pasolini’s poem is not his roman­ti­ciza­tion of the police’s pur­ported pro­le­tar­ian iden­tity, but instead the ques­tion of the com­po­si­tion of the rev­o­lu­tion­ar­ies. The prob­lem this poses is that the repres­sive state appa­ra­tus has greater con­tact with many more lay­ers of the pro­le­tariat than the polit­i­cal move­ment. In many spec­tac­u­lar street con­fronta­tions the police have seemed to be the only rep­re­sen­ta­tives of the “tra­di­tional” work­ing class, includ­ing peo­ple of color, allow­ing the reac­tionary media to rep­re­sent the pro­test­ers as enti­tled col­lege stu­dents. And there can be no doubt that the police force recruits from the under­class; it offers one of the last careers avail­able. Though in the abstract it is pos­si­ble to bring the police over to our side – the pro­test­ers in Wis­con­sin suc­cess­fully won the sup­port of the police – this strat­egy can’t be assumed as some kind of utopian reflex. The Oak­land Police Depart­ment gave us a cru­cial reminder of the insta­bil­ity of Pasolini’s per­spec­tive, when the vicious and obscene vio­lence used for years against the black com­mu­nity was brought down upon Occupy Oak­land. The real goal of the move­ment should be to move past the fetishiza­tion of the police, and to forge deeper con­nec­tions with excluded seg­ments of the pro­le­tariat, sur­round­ing the police with their neigh­bors along­side col­lege students. What­ever the com­po­si­tion of the police, they remain an index of the state’s expe­ri­ence of protest. Remem­ber the wise words of William S. Bur­roughs: “a func­tion­ing police state needs no police.” The Wall Street occu­pa­tion was taken far more seri­ously when the pep­per spray came out; even more when 700 were arrested on the Brook­lyn Bridge. The acts of vio­lence per­pe­trated by police have served as indi­ca­tion that the protest is a threat to the state’s func­tion­ing. Deter­min­ing the next steps will require care­ful con­sid­er­a­tion, and lead­er­ship by peo­ple of color, who have the most expe­ri­ence deal­ing with police violence. Some squea­mish left-liberals com­plain that the Occupy move­ment lacks orga­ni­za­tion. This is obvi­ously ridicu­lous. How can the sim­ple occu­pa­tion of a park spon­ta­neously ignite sim­i­lar occu­pa­tions in well over 50 Amer­i­can cities, incite a global protest in nearly 900 cities across the globe, and suc­cess­fully link together a series of het­ero­ge­neous strug­gles with­out any form of orga­ni­za­tion? The Occupy move­ment is per­haps one of the most orga­nized move­ments in history. An accom­pa­ny­ing com­plaint is that the occu­pa­tions have not put forth demands. But it’s not at all clear that demands are a suf­fi­cient con­di­tion for social trans­for­ma­tion. To a cer­tain extent, as we wrote about the Lon­don riots, the refusal to make demands is a protest against the idea that the exist­ing order could make our lives bet­ter, a refusal to speak in capital’s lan­guage. At the same time, the absence of “offi­cial,” insti­tu­tional demands coex­ists with an incred­i­ble mul­ti­plic­ity of demands made by indi­vid­ual pro­test­ers, as the list of griev­ances in the first offi­cial state­ment indicates. The impor­tant ques­tion is whether this orga­ni­za­tion is durable, and whether the movement’s demands put the social struc­ture into ques­tion. No spon­ta­neous col­lec­tiv­ity could come together with­out at least an abstract set of com­mon demands, and it would be unable repro­duce itself with­out some kind of orga­ni­za­tional form. But can these forms rad­i­cal­ize the demands so that they are ori­ented towards the trans­for­ma­tion of the social real­ity out­side of them? The mean­ing and polit­i­cal effect of demands will depend ulti­mately on the orga­ni­za­tional struc­ture that makes them. It’s pos­si­ble, for exam­ple, that even a highly desir­able demand, like free health­care, could be posed by a fac­tion of the pro­tes­tors who will make it pos­si­ble to dis­solve the move­ment into the Demo­c­ra­tic Party. But this dynamic could just as eas­ily work in the other direc­tion. 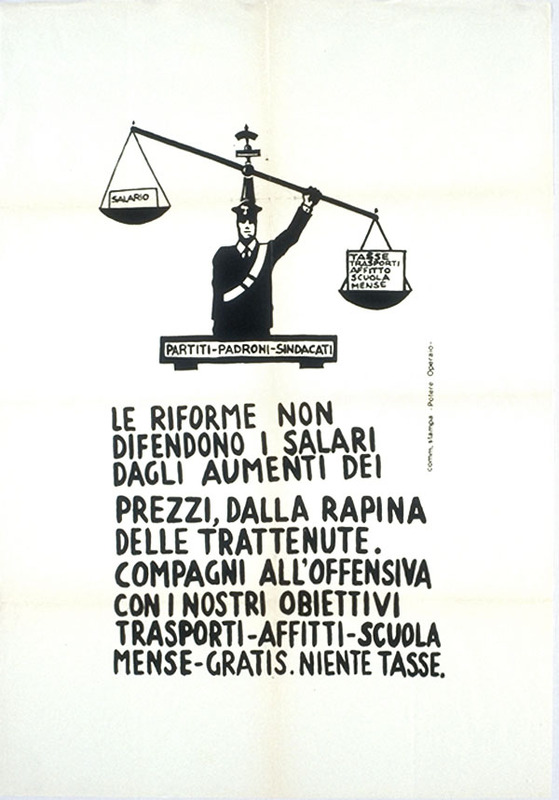 Take, for exam­ple, this poster pro­duced by the Ital­ian rev­o­lu­tion­ary group Potere Operaio (Work­ers’ Power). The other puz­zle is the final demand: “no taxes.” Isn’t this the core plat­form of the right, of free-market extrem­ists? It is, of course, but this demand is a plat­form of the right because it is embed­ded in class, in the orga­nized struc­ture of the rul­ing class. No taxes for whom? The cap­i­tal­ist class tries to escape from taxes, to con­tinue to redis­trib­ute wealth towards the top, and to give the state an excuse to dis­man­tle the social gains made by labor. But if the cap­i­tal­ist class was sub­jected to a tax that even began to approach the per­cent­age it expro­pri­ates from work­ers, this would ren­der taxes on work­ers obsolete. Since the tax is expe­ri­enced by work­ers as yet another deduc­tion from the wage, while the pub­lic pro­grams that ben­e­fit them are on the chop­ping block, it seems unnec­es­sary to allow the right to monop­o­lize the attack on taxes. If an anti-tax plat­form is put for­ward by work­ers as a class, it rep­re­sents a pro­gram of elim­i­nat­ing one deduc­tion from the wage while charg­ing cap­i­tal­ists for the main­te­nance of the state. The demand to tax the rich is, of course, accepted by many left-liberals. While it’s def­i­nitely a good idea to charge the cap­i­tal­ists, tax­ing the rich as the max­i­mum pro­gram sets us up for social devel­op­ment by the state. The occu­pa­tion move­ment gives us the poten­tial to inde­pen­dently develop the class. Other demands may be more appro­pri­ate for our sit­u­a­tion. But they will have to be put for­ward by an orga­ni­za­tional struc­ture that rep­re­sents a uni­tary class power. And the con­struc­tion of such a form of orga­ni­za­tion will have to emerge from strate­gies of action that pro­duce class solidarity. A con­crete exam­ple of this kind of strat­egy took place in La Puente, Cal­i­for­nia. Rose Gudiel, who was about to be evicted from her fore­closed home, dis­cussed her sit­u­a­tion at Occupy LA. Her seem­ingly per­sonal story turned out to be a social one; oth­ers there had suf­fered a sim­i­lar fate. Many of the occu­piers fol­lowed her back to her home in sup­port. A few days later over two hun­dred joined her as she protested in front of the man­sion of OneWest’s CEO; the next day they staged a sit-in at the Pasadena branch of Fan­nie Mae. Faced with such wide­spread oppo­si­tion the bank gave in and decided to mod­ify her loan. This was a strat­egy, how­ever spon­ta­neous, that united par­tic­i­pants in the move­ment who were hit by fore­clo­sures. It pro­vided a con­cep­tual lan­guage in which indi­vid­u­als began to rec­og­nize that their own prob­lems are closely related to other seem­ingly dis­tinct prob­lems. Not every­one who sup­ported Gudiel was fac­ing evic­tion; they joined her in part because they rec­og­nized that their own dif­fi­cul­ties – unem­ploy­ment, debt, ris­ing cost of liv­ing – were con­nected to hers. The woman who loses her home is not so dif­fer­ent from the neigh­bor that lost his job. The power of this strat­egy emerged from a unique kind of sol­i­dar­ity. For the banks to fight Guidel, they had to fight the whole movement. A fore­closed home is an inter­est­ing site for an occu­pa­tion. Among the many dif­fer­ences between a house and Zuc­cotti Park is the fact that a house has a roof. And this brings us back to the weather. Everybody’s talk­ing about it; every­body knows that win­ter will force the move­ment to rethink its tac­tics. This is the pol­i­tics of weather: it’s not some neu­tral phe­nom­e­non, but a weapon like any other. We will have to use it to our advan­tage before cap­i­tal enlists it to crush our movement. This won’t be the first time weather has fig­ured promi­nently in a strug­gle. A reform ban­quet was sched­uled by the mod­er­ate oppo­si­tion to take place in Paris on Feb­ru­ary 22, 1848. Fear­ing an esca­la­tion of the already exist­ing con­flict, hop­ing to break the sol­i­dar­ity of the oppo­si­tion, and know­ing full well that the dis­trict where the meet­ing was to be held was a real hotbed of rev­o­lu­tion­ary activ­ity, the forces of order can­celled the ban­quet the night before, undoubt­edly hop­ing that the week’s hor­ri­ble weather would work to keep the demon­stra­tors away. But despite the heavy clouds, cold wind, and bit­ing rain, the pro­test­ers took to the streets any­way, enraged by this provo­ca­tion, and quickly set about build­ing bar­ri­cades, loot­ing gun shops, and throw­ing stones at the National Guard. While order was restored in some of the more pub­lic places, the demon­stra­tors strate­gi­cally regrouped in their labyrinthine neigh­bor­hoods. Already a chal­lenge for the army, the wind­ing streets, tor­tu­ous alley­ways, and bewil­der­ing ter­rain became even more dan­ger­ous to out­siders now that it was pour­ing rain. So the forces of order hoped to use the weather to dis­suade pro­test­ers from com­ing out; the pro­test­ers ended up strate­gi­cally using the weather to bol­ster their pri­mary points of resis­tance and esca­late the strug­gle. So began the rev­o­lu­tion of 1848 in France. We can also use the weather to our advan­tage. The forces of order are hop­ing that win­ter will kill off the move­ment by forc­ing us to retreat back to our homes. We should do just that. We should strate­gi­cally regroup by reoc­cu­py­ing fore­closed homes, squat­ting aban­doned apart­ments, occu­py­ing var­i­ous other build­ings, trans­form­ing each and every one of these into the cells of an esca­lat­ing move­ment. From the occu­pa­tion of a pub­lic park we can shift towards reoc­cu­py­ing those spaces from which we have been forcibly ejected by mount­ing debt, unem­ploy­ment, aus­ter­ity mea­sures, and cuts to social ser­vices. We can take back the pub­lic libraries, schools, lost homes, com­mu­nity cen­ters, and more. The point is to con­stantly think of cre­ative ways to use the weapons of our ene­mies against them. Let’s start with the barometers.